Offering you a complete choice of products which include aluminium machine guarding. From our extensive range of products, our clients can avail a broad assortment of Aluminium Machine Guarding that is manufactured using supreme grade raw materials in sync with the international standards of quality & design. These guarding can be customizable with swivel/sliding doors with the combination of partitions etc. 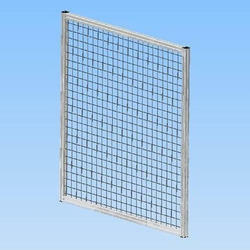 The offered machine guarding is widely used as guards in automatic machines, robots, barrier guards etc. Offered range is available at market leading prices.